Porsche is producing 256 911 GT3 Cup cars for wealthy privateers to campaign in the 2008 season Mobil1 Supercup, Carrera Cup and GT3 Cup Challenge. The new GT3 Cup is a yet another evolution of the model, producing 420 HP from its 3.6-liter flat-six and expelling spent hydrocarbons through a competition-spec exhaust. Power is routed through a sequential six-speed 'box with a 5.5-inch three-plate clutch, oil/water heat exchanger and single mass flywheel allowing drivers to rip through the ratios while keeping the long pedal planted to the floorboard. Weight has been reduced to 2491 pounds through the use of carbon fiber and reinforced plastic door panels, boot lid and rear body panels, along with ceramic composite brakes. Sachs dampers and double coil springs keep things planted around the road course, and allow for infinite adjustability of height, camber and track. All the techy tidbits are available in the press release after the jump. 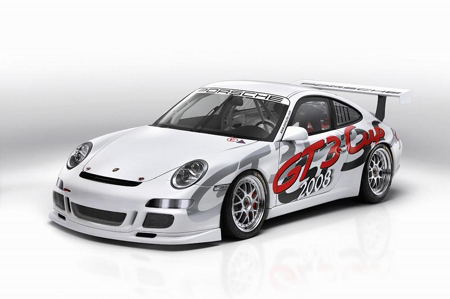 The new Porsche 911 GT3 Cup is entering the 2008 motorsport season with engine output increased to 420 bhp. The car will be raced in the Porsche Mobil1 Supercup, the world's fastest international brand trophy, and worldwide in national Porsche Carrera Cups and GT3 Cup Challenges. 265 units of this production-based racing car developed in Weissach will be built on Porsche's production line in Stuttgart-Zuffenhausen, marking a new record for a car of this category. The most significant modification compared with last year's model is the new rear end following the design of the production model. Air venting slits ensure better dissipation of heat at the rear. The 3.6-litre six-cylinder boxer engine developed in Weissach is also based on the street-legal GT3 and develops maximum output of 420 bhp, 20 horsepower more than on the previous model. The sequential six-speed transmission with interruption of engine power enables the driver to shift up under full throttle without disengaging the clutch. The transmission itself has been optimised and the gear ratios adjusted to the characteristics of the engine. Weighing 1,150 kg in race trim, the new 911 GT3 Cup has a power-to-weight ratio of 2.7 kg per horsepower. Porsche's Racing Department in Weissach is responsible for the fine-tuning and running in the 911 GT3 Cup cars. Deliveries will be directly from Weissach, depending on the country of destination and the schedules to be observed. While the cars for the Carrera Cup New Zealand have already been shipped, delivery of the racing cars for the Porsche Mobil1 Supercup and the Carrera Cup Germany is scheduled for early March 2008.